Capitoline Wolf. 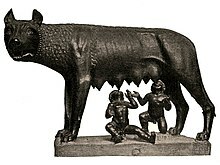 Traditional scholarship says the wolf-figure is Etruscan, 5th century BC, with figures of Romulus and Remus added in the 15th century AD by Antonio Pollaiuolo. Recent studies suggest that the wolf may be a medieval sculpture dating from the 13th century AD. Romulus /ˈrɒmjᵿləs/ and Remus /ˈriːməs/ were the twin brothers and main characters of Rome’s foundation myth. 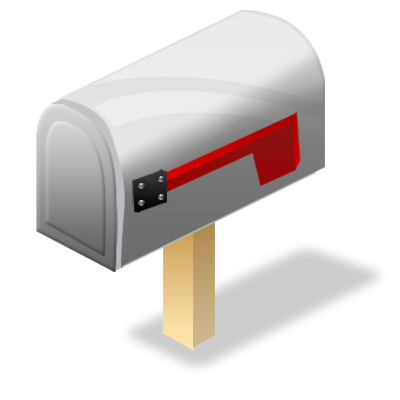 (The pronunciation in English is different from the Latin original Rōmulus and Rĕmus). Their mother wasRhea Silvia, daughter of Numitor, king of Alba Longa. Before their conception, Numitor’s brother Amulius seized power, killed Numitor’s male heirs and forced Rhea Silvia to become a Vestal Virgin, sworn to chastity. Rhea Silvia conceived the twins by the god Mars. Once the twins were born, Amulius had them abandoned to die in the Tiber river. They were saved by a series of miraculous interventions: the river carried them to safety, a she-wolf found and suckled them, and a woodpecker fed them. A shepherd and his wife found them and fostered them to manhood as simple shepherds. The twins, still ignorant of their true origins, proved to be natural leaders. Each acquired many followers. When they discovered the truth of their birth, they killed Amulius and restored Numitor to his throne. Rather than wait to inherit Alba Longa, they chose to found a new city. While Romulus wanted to found the new city on the Palatine Hill, Remus preferred the Aventine Hill. They agreed to determine the site through augury but when each claimed the results in his own favor, they quarreled and Remus was killed. Romulus founded the new city, named it Rome, after himself, and created its first legions and senate. The new city grew rapidly, swelled by landless refugees; as most of these were male and unmarried, Romulus arranged the abduction of women from the neighboring Sabines. The ensuing war ended with the joining of Sabines and Romans as one Roman people. Thanks to divine favour and Romulus’s inspired leadership, Rome became a dominant force, but Romulus himself became increasingly autocratic, and disappeared or died in mysterious circumstances. In later forms of the myth, he ascended to heaven and was identified with Quirinus, the divine personification of the Roman people. The legend as a whole encapsulates Rome’s ideas of itself, its origins and moral values. For modern scholarship, it remains one of the most complex and problematic of all foundation myths, particularly Remus’s death. Ancient historians had no doubt that Romulus gave his name to the city. Most modern historians believe his name a back-formation from the name Rome; the basis for Remus’s name and role remain subjects of ancient and modern speculation. The myth was fully developed into something like an “official”, chronological version in the Late Republican and early Imperial era; Roman historians dated the city’s foundation to between 758 and 728 BC, andPlutarch reckoned the twins’ birth year as c. 27/28 March 771 BC. An earlier tradition that gave Romulus a distant ancestor in the semi-divine Trojan prince Aeneas was further embellished, and Romulus was made the direct ancestor of Rome’s first Imperial dynasty. Possible historical bases for the broad mythological narrative remain unclear and disputed. The image of the she-wolf suckling the divinely fathered twins became an iconic representation of the city and its founding legend, making Romulus and Remus preeminent among the feral children of ancient mythography. Modern scholarship approaches the various known stories of Romulus and Remus as cumulative elaborations and later interpretations of Roman foundation-myth. Particular versions and collations were presented by Roman historians as authoritative, an official history trimmed of contradictions and untidy variants to justify contemporary developments, genealogies and actions in relation to Roman morality. Other narratives appear to represent popular or folkloric tradition; some of these remain inscrutable in purpose and meaning. Wiseman sums the whole as the mythography of an unusually problematic foundation and early history. Cornell and others describe particular elements of the mythos as “shameful”. 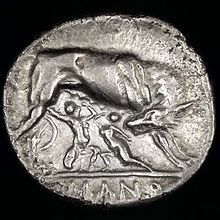 Nevertheless, by the 4th century BC, the fundamentals of the Romulus and Remus story were standard Roman fare, and by 269 BC the wolf and suckling twins appeared on one of the earliest, if not the earliest issues of Roman silver coinage. Rome’s foundation story was evidently a matter of national pride. It featured in the earliest known history of Rome, which was attributed to Diocles of Peparethus. The patrician senator Quintus Fabius Pictor used Diocles’ as a source for his own history of Rome, written around the time of Rome’s war with Hannibal and probably intended for circulation among Rome’s Greek-speaking allies. Fabius’ history provided a basis for the early books of Livy’s Ab Urbe Condita, which he wrote in Latin, and for several Greek-language histories of Rome, including Dionysius of Halicarnassus‘s Roman Antiquities, written during the late 1st century BC, and Plutarch‘s early 2nd century Life of Romulus. These three accounts provide the broad literary basis for studies of Rome’s founding mythography. They have much in common, but each is selective to its purpose. Livy’s is a dignified handbook, justifying the purpose and morality of Roman traditions observed in his own times. Dionysius and Plutarch approach the same subjects as interested outsiders, and include founder-traditions not mentioned by Livy, untraceable to a common source and probably specific to particular regions, social classes or oral traditions. A Roman text of the late Imperial era, Origo gentis Romanae (The origin of the Roman people) is dedicated to the many “more or less bizarre”, often contradictory variants of Rome’s foundation myth, including versions in which Remus founds a city named Remuria, five miles from Rome, and outlives his brother Romulus. There are several variations on the basic legendary tale. Plutarch presents Romulus’s and Remus’s ancient descent from prince Aeneas, fugitive from Troy after its destruction by the Achaeans. Their maternal grandfather is his descendant Numitor, who inherits the kingship of Alba Longa. Numitor’s brother Amuliusinherits its treasury, including the gold brought by Aeneas from Troy. Amulius uses his control of the treasury to dethrone Numitor, but fears that Numitor’s daughter, Rhea Silvia, will bear children who could overthrow him. Amulius forces Rhea Silvia into perpetual virginity as a Vestal priestess, but she bears children anyway. In one variation of the story, Mars, god of war, seduces and impregnates her: in another, Amulius himself seduces her, and in yet another, Hercules. The king sees his niece’s pregnancy and confines her. She gives birth to twin boys of remarkable beauty; her uncle orders her death and theirs. One account holds that he has Rhea buried alive – the standard punishment for Vestal Virgins who violated their vow ofcelibacy – and orders the death of the twins by exposure; both means would avoid his direct blood-guilt. In another, he has Rhea and her twins thrown into the River Tiber. In every version, a servant is charged with the deed of killing the twins, but cannot bring himself to harm them. He places them in a basket and leaves it on the banks of the Tiber. The river rises in flood and carries the twins downstream, unharmed. The river deity Tiberinus makes the basket catch in the roots of a fig tree that grows in the Velabrum swamp at the base of the Palatine Hill. The twins are found and suckled by a she-wolf (Lupa) and fed by a woodpecker (Picus). A shepherd of Amulius named Faustulus discovers them and takes them to his hut, where he and his wife Acca Larentia raise them as their own children. In another variant, Hercules impregnates Acca Larentia and marries her off to the shepherd Faustulus. She has twelve sons; when one of them dies, Romulus takes his place to found the priestly college of Arval brothers Fratres Arvales. Acca Larentia is therefore identified with the Arval goddess Dea Dia, who is served by the Arvals. In later Republican religious tradition, a Quirinal priest (flamen) impersonated Romulus (by then deified as Quirinus) to perform funerary rites for his foster mother (identified as Dia). Another and probably late tradition has Acca Larentia as a sacred prostitute (one of many Roman slangs for prostitute was lupa (she-wolf)). 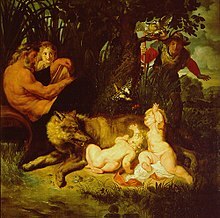 Yet another tradition relates that Romulus and Remus are nursed by the Wolf-Goddess Lupa or Luperca in her cave-lair (lupercal). Luperca was given cult for her protection of sheep from wolves and her spouse was the Wolf-and-Shepherd-God Lupercus, who brought fertility to the flocks. She has been identified with Acca Larentia. In all versions of the founding myth, the twins grew up as shepherds. While tending their flocks, they came into conflict with the shepherds of Amulius. Remus was captured and brought before Amulius, who eventually discovers his identity. Romulus raised a band of shepherds to liberate his brother and Amulius was killed. Romulus and Remus were conjointly offered the crown but they refused it and restored Numitor to the throne. They left to found their own city, but could not agree on its location; Romulus preferred the Palatine Hill, Remus preferred the Aventine Hill. They agreed to seek the will of the gods in this matter, through augury. Each took position on his respective hill and prepared a sacred space there. Remus saw six auspicious birds; but Romulus saw twelve. Romulus claimed superior augury as the divine basis of his right to decide. Remus made a counterclaim: he saw his six vultures first. Romulus set to work with his supporters, digging a trench (or building a wall, according to Dionysius) around the Palatine to define his city boundary. Livy gave two versions of Remus’s death. In the one “more generally received”, Remus criticized and belittles the new wall, and in a final insult to the new city and its founder alike, he leaped over it. Romulus killed him, saying “So perish every one that shall hereafter leap over my wall”. In the other version, Remus was simply stated as dead; no murder was alleged. Two other, lesser known accounts have Remus killed by a blow to the head with a spade, wielded either by Romulus’s commander Fabius (according to St. Jerome’s version) or by a man named Celer. 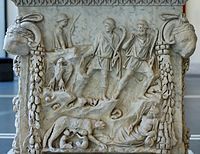 Romulus buried Remus with honour and regret. The Roman ab urbe condita began from the founding of the city, and places that date as 21 April 753 BC. Romulus completed his city and named it Roma after himself. Then he divided his fighting men into regiments of 3000 infantry and 300 cavalry, which he called “legions”. From the rest of the populace he selected 100 of the most noble and wealthy fathers to serve as his council. He called these men Patricians: they were fathers of Rome, not only because they cared for their own legitimate citizen-sons but because they had a fatherly care for Rome and all its people. They were also its elders, and were therefore known asSenators. Romulus thereby inaugurated a system of government and social hierarchy based on the patron-client relationship. Rome drew exiles, refugees, the dispossessed, criminals and runaway slaves. The city expanded its boundaries to accommodate them; five of the seven hills of Rome were settled: the Capitoline Hill, the Aventine Hill, the Caelian Hill, the Quirinal Hill, and the Palatine Hill. As most of these immigrants were men, Rome found itself with a shortage of marriageable women. Romulus invited the neighboring Sabines and Latins, along with their womenfolk, to a festival at the Circus Maximus, in honour of Consus (or of Neptune). While the men were distracted by the games and befuddled with wine, the Romans seized their daughters and took them into the city. Most were eventually persuaded to marry Roman men. The Sabine and Latin men demanded the return of their daughters. The inhabitants of three Latin towns (Caenina, Antemnae and Crustumerium) took up arms one after the other but were soundly defeated by Romulus, who killed Acron, the king of Caenina, with his own hands and celebrated the first Roman triumph shortly after. Romulus was magnanimous in victory – most of the conquered land was divided among Rome’s citizens but none of the defeated were enslaved. The Sabine king Titus Tatius marched on Rome to assault its Capitoline citadel. The citadel commander’s daughter Tarpeia opened the gates for them, in return for “what they wear on their left arms”. She expected their golden bracelets. Once inside, the Sabines crushed her to death under a pile of their shields. The Sabines left the citadel to meet the Romans in open battle in the space later known as the comitium. The outcome hung in the balance; the Romans retreated to the Palatine Hill, where Romulus called on Jupiter for help – traditionally at the place where a temple to Jupiter Stator (“the stayer”) was built. The Romans drove the Sabines back to the point where the Curia Hostilia later stood. The Sabine women themselves then intervened to beg for unity between Sabines and Romans. A truce was made, then peace. The Romans based themselves on the Palatine and the Sabines on the Quirinal, with Romulus and Tatius as joint kings and the Comitium as the common centre of government and culture. 100 Sabine elders and clan leaders joined the Patrician Senate. The Sabines adopted the Roman calendar, and the Romans adopted the armour and oblong shield of the Sabines. The legions were doubled in size. Romulus and Tatius ruled jointly for five years and subdued the Alban colony of the Camerini. Then Tatius sheltered some allies who had illegally plundered the Lavinians, and murdered ambassadors sent to seek justice. Romulus and the Senate decided that Tatius should go to Lavinium to offer sacrifice and appease his offence. At Lavinium, Tatius was assassinated and Romulus became sole king. As king, Romulus held authority over Rome’s armies and judiciary. He organized Rome’s administration according to tribe; one of Latins (Ramnes), one of Sabines (Titites), and one of Luceres. Each elected a tribune to represent their civil, religious, and military interests. The tribunes were magistrates of their tribes, performed sacrifices on their behalf, and commanded their tribal levies in times of war. Romulus divided each tribe into ten curiae to form the Comitia Curiata. The thirty curiae derived their individual names from thirty of the kidnapped Sabine women. The individual curiae were further divided into ten gentes, held to form the basis for the nomen in the Roman naming convention. Proposals made by Romulus or the Senate were offered to the Curiate assembly for ratification; the ten gentes within each curia cast a vote. Votes were carried by whichever gens has a majority. Romulus formed a personal guard called the Celeres; these were three hundred of Rome’s finest horsemen. They were commanded by a tribune of the Ramnes; in one version of the founding tale, Celer killed Remus and helped Romulus found the city of Rome. The provision of a personal guard for Romulus helped justify the Augustan development of a Praetorian Guard, responsible for internal security and the personal safety of the Emperor. The relationship between Romulus and his Tribune resembled the later relation between the Roman Dictator and his Magister Equitum. Celer, as the Celerum Tribune, occupied the second place in the state, and in Romulus’s absence had the rights of convoking the Comitia and commanding the armies. For more than two decades, Romulus waged wars and expanded Rome’s territory. He subdued Fidenae, which seized Roman provisions during a famine, and founded a Roman colony there. Then he subdued the Crustumini, who had murdered Roman colonists in their territory. The Etruscans of Veii protested the presence of a Roman garrison at Fidenae, and demanded the return of the town to its citizens. When Romulus refused, they confronted him in battle and were defeated. 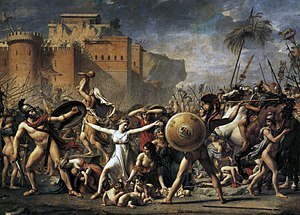 They agreed to a hundred-year truce and surrendered fifty noble hostages: Romulus celebrated his third and last triumph. When Romulus’s grandfather Numitor died, the people of Alba Longa offered him the crown as rightful heir. Romulus adapted the government of the city to a Roman model. Henceforth, the citizens held annual elections and choose one of their own as Roman governor. In Rome, Romulus began to show signs of autocratic rule. The Senate becomes less influential in administration and lawmaking; Romulus ruled by edict. He divided his conquered territories among his soldiers without Patrician consent. Senatorial resentment grew to hatred. According to the legend, Romulus “mysteriously” disappeared in a storm or whirlwind, during or shortly after offering public sacrifice at or near the Quirinal Hill. A “foul suspicion” arises that the Senate, weary of kingly government, and exasperated of late by the imperious deportment of Romulus toward them, had plotted against his life and made him away, so that they might assume the authority and government into their own hands. This suspicion they sought to turn aside by decreeing divine honors to Romulus, as to one not dead, but translated to a higher condition. And Proculus, a man of note, took oath that he saw Romulus caught up into heaven in his arms and vestments, and heard him, as he ascended, cry out that they should hereafter style him by the name of Quirinus. Livy infers Romulus’s murder as no more than a dim and doubtful whisper from the past; in the circumstances, Proculus’ declaration is wise and practical because it has the desired effect. Cicero’s seeming familiarity with the story of Romulus’s murder and divinity must have been shared by his target audience and readership. Dio’s version, though fragmentary, is unequivocal; Romulus is surrounded by hostile, resentful senators and “rent limb from limb” in the senate-house itself. An eclipse and sudden storm, “the same sort of phenomenon that had attended his birth”, conceal the deed from the soldiers and the people, who are anxiously seeking their king. Proculus fakes a personal vision of Romulus’s spontaneous ascent to heaven as Quirinus and announces the message of Romulus-Quirinus; a new king must be chosen at once. A dispute arises: should this king be Sabine or Roman? The debate goes on for a year. During this time, the most distinguished senators rule for five days at a time as interreges. Plutarch says that Romulus was 53 (“in the fifty-fourth year of his age”) when he “vanished” in 717 BC; this gives the twins a birth-date in the year 771 BC, and Romulus’s founding of Rome at the age of 18. Dionysius of Halicarnassus says that Romulus began his reign at 18, ruled for 37 years and died at 55 years old. Ennius (fl. 180s BC) refers to Romulus as a divinity without reference to Quirinus, whom Roman mythographers identified as an originally Sabine war-deity, and thus to be identified with Roman Mars. Lucilius lists Quirinus and Romulus as separate deities, and Varroaccords them different temples. Images of Quirinus showed him as a bearded warrior wielding a spear as a god of war, the embodiment of Roman strength and a deified likeness of the city of Rome. He had a Flamen Maior called the Flamen Quirinalis, who oversaw his worship and rituals in the ordainment of Roman religion attributed to Romulus’s royal successor, Numa Pompilius. There is however no evidence for the conflated Romulus-Quirinus before the 1st century BC. Ovid in Book 14, lines 812-828, of the Metamorphoses gives a description of the deification of Romulus and his wife Hersilia, who are given the new names of Quirinus and Hora respectively. Mars, the father of Romulus, is given permission by Jupiter to bring his son up to Olympus to live with the Olympians. Ovid uses the words of Ennius as a direct quote and puts them into the mouth of the King of the Gods, “There shall be one whom you shall raise to the blue vault of heaven”. Ovid then uses a simile to describe the change that Romulus undertakes as he ascends to live with the Olympians, “as leaden balls from a broad sling melt in mid sky: Finer his features now and worthier of heaven’s high-raised couch, his lineaments those of Quirinus in his robe of state”. Also there are coins with Lupa and the tiny twins placed beneath her. The Franks Casket, an Anglo-Saxon ivory box (early 7th century AD) shows Romulus and Remus in an unusual setting, two wolves instead of one, a grove instead of one tree or a cave, four kneeling warriors instead of one or two gesticulating shepherds. According to one interpretation, and as the runic inscription (“far from home”) indicates, the twins are cited here as the Dioscuri, helpers at voyages such as Castor and Polydeuces. Their descent from the Roman god of war predestines them as helpers on the way to war. The carver transferred them into the Germanic holy grove and has Woden’s second wolf join them. Thus the picture served — along with five other ones — to influence “wyrd“, the fortune and fate of a warrior king. The novel Founding Fathers by Alfred Duggan describes the founding and first decades of Rome from the points of view of Marcus, one of Romulus’s Latin followers, Publius, a Sabine who settles in Rome as part of the peace agreement with Tatius, Perperna, an Etruscan fugitive who is accepted into the tribe of Luceres after his own city is destroyed, and Macro, a Greek seeking purification from blood-guilt who comes to the city in the last years of Romulus’s reign. Publiusa and Perpernia become senators. Romulus is portrayed as a gifted leader though a remarkably unpleasant person, chiefly distinguished by his luck; the story of his surreptitious murder by the senators is adopted, but although the story of his deification is fabricated, his murderers themselves think he may indeed have become a god. The novel begins with the founding of the city and the killing of Remus, and ends with the accession of Numa Pompilius. In Harry Potter, one of the characters is named after Remus—Remus John Lupin. And at one point uses the code name Romulus. Professor Lupin is a teacher of defence against the dark arts, and is in fact a werewolf. This reflects the Remus of roman mythology, who was raised by a wolf. In Assassin’s Creed: Brotherhood Romulus is worshiped as a god by the Followers of Romulus cult. The main character, Ezio Auditore, comes into conflict with the cult on several occasions during his adventures in Rome while trying to locate the keys to the Armor of Brutus, wiping out the cult in the process. In the Death Grips song, “Black Quarterback” Romulus and Remus are mentioned. In characteristic Death Grips style, their lyric isn’t contextualised in any typical linear sense. “Up the Wolves” by The Mountain Goats is a song that alludes to Romulus and Remus.